Explore the enchanting gems of the Middle East with a fully-customizable tour of Israel and Jordan. Discover the secrets of the well-preserved ancient landmarks with professional local guides, experience the architectural wonders of Petra, and other unique must-sees of Jerusalem, Tel Aviv, the capital of Jordan, Amman, and Roman Jerash, as well as the town of mosaics, Madaba. Stay at best hotels both in the cities and on the Dead Sea shores, and we'll take care of all the hard logistics and visas. Welcome to Israel! 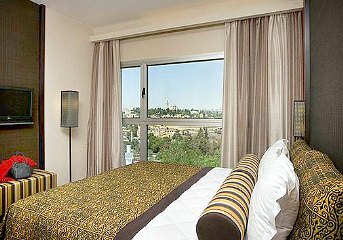 Upon arrival, you are met by your private driver, who transfers you to your hotel in Jerusalem for the check-in. Here you get to know the cluster of neighborhoods in the center of the city. You take a great chance to feel like a local and continue to the atmospheric Machaneh Yehudah Market which is the true heart of Jerusalem. Following the tour, you may continue the exploration of the city on your own or return to the hotel. After breakfast at the hotel, you join a small group day tour devoted to the exploration of the city and a tour to Bethlehem. Today, you see unmissable sites, starting with the Mount of Olives for a panoramic view of the city. Then you proceed to Mount Zion, located on the southern end of the old city, see the traditional sites of the Last Supper and visit King David's Tomb. In the Old City, you start a walking tour of Jewish, Christian and Armenian Quarters. You walk along the Via Dolorosa and visit the Church of the Holy Sepulchre. A must-see highlight of Jerusalem tour is a The Western Wall, one of the holiest Jewish sites. Today you also visit Bethlehem - the biblical birthplace of Jesus and a major Christian pilgrimage destination. At the Palestinian border, your change transportation and the local guide takes you to Bethlehem. There you visit the Church of Nativity, built over the cave venerated as Christ's birthplace in AD 339. After you drive through the city and get back to the Israel border to meet with your Jerusalem guide and driver. Following the tour, you return to the hotel and rest of the day is at leisure. Early in the morning you join an exciting 12-hour day trip to the incredible Christian site - the city of Nazareth, and the northern Israeli region called Galilee. The first stop on your route is Nazareth where you visit the Catholic Church of Annunciation and the Church of St. Joseph. Then you drive by towns Cana and Tiberius, located on the shore of Galilee Sea, and arrive in Capernaum, also known as "the town of Jesus". Once abandoned and forgotten, this site was excavated in the 1900's and today you may visit the Jewish Synagogue. Then you continue to the site of the Miracle of Fish and Loaves located at the foot of the Golan Heights and reach Yardenit, the famous Baptismal site where Jordan river flows out of the Sea of Galilee. After breakfast at the hotel and check out you meet your private driver who takes you to Tel Aviv and upon arrival, you start your private 4-hour walking* tour to the old town Jaffa, one of the ancient port cities in Israel and the Mediterranean basin. Jaffa city is associated with Jonah, Solomon and Saint Peter as well as the mythological story of Andromeda and Perseus. Together with your guide, you stroll along the alleys of Old Jaffa, see the sculpture of "floating orange", pass by the House of Simon the Tanner and the 19th-century St Michael Greek-Orthodox Church. Afterward, you arrive at the main Plaza of Jaffa and visit the Franciscan St. Peter’s Church, built on the remains of a Crusader Fortress. Then you continue to the flea market full of boutiques, laid-back cafes, pop-up bars and colorful street stalls selling vintage clothes, objects, and furniture. Please note: 2-way public transportation tickets are included in the tour. Flea market is not working on Saturday. After breakfast and check-out, you are met by your private driver in the hotel lobby and transferred to the airport for a short flight to Amman - the capital city of Jordan. Upon arrival, you are met by your private driver, who transfers you to your hotel in Amman for the check-in. The rest of the day is at your own leisure to relax after the trip. After breakfast at your hotel, meet your private guide and driver at your hotel lobby and set off on a 5-hour Amman and Jerash tour to discover the Modern Amman and the ancient part of Jordan's capital, as well as the most well-preserved city of the Roman Empire. You start from the famous archeological site of the Citadel, located on the highest hill in the center of Amman. You also explore the 2nd century Roman Theatre, the Old Market as well as the majestic King Abdullah I Mosque, capped by a breathtaking blue mosaic dome. Afterwards, you head to Jerash, which has been inhabited since the Bronze Age. Here you discover the history and the remains of the ancient city, nestled in a green and well-watered valley in the biblical land of Gilead. After the tour, you are taken to the hotel and the rest of the day is at leisure. After breakfast and check-out, meet your guide-driver and start your journey to the Dead Sea. On the route, you enjoy a guided tour in Madaba, renowned for the unique Byzantine-era mosaics. There you witness the beauty of Church of the Virgin Mary, dated to the year 767 AD, as well as the astonishing artifacts from the Hellenistic, Roman, Byzantine and Islamic eras. Then you proceed to the biblical hill of Mount Nebo, believed to be the tomb of Moses. Moreover, the hill provides just spectacular views across the Jordan Valley and the Dead Sea. After the tour, you are taken to your resort hotel on the Dead Sea shore. After breakfast at your hotel, meet your English speaking driver and travel to the south of Jordan to discover one of the country's most valuable treasures - the rose-red city of Petra. Your driver takes you from the hotel to Petra where you meet a local guide. In about 3-hours you explore the main attractions of this unique city, passing the Siq, a narrow gorge where you get the first close views of the colorful sandstone, ending at the beautiful Treasury, one of the most outstanding temples in Petra. You walk along the Street of Facades, lined with the impressive Royal Tombs, set high on the mountainside; the Theatre and the remarkable Temple of Qasr Al Bint (or the Castle of the Pharaoh's Daughter), built in around 30 BCE. After the tour, you are taken back to the hotel. Full visa services for 1-entry Jordan visa for US, Australia and New Zealand citizens.